Picturesque circuit touring the old and new city that stands out for its architectural layout, the traditional groves, the system of water conduction in ditches and its wide and clean paths. Traveling through its streets, we will be taking contact with the history and culture of a town, which with great effort was transforming the desert into a prosperous oasis. Our tour begins in the Foundational Area (historical site where the city was founded in 1561 and space where the Museum and Foundational Plaza and the Jesuit ruins are located, vestige of the city prior to the earthquake of 1861). Continuing the tour we will visit the main squares, the Cathedral, San Francisco church, the former Banco Hipotecario (current Ministry of Culture and Tourism), the Andean Mercantile and the former Banco de Mendoza (current Contemporary Art Space) ), Plaza Independencia and Plaza España, the Civic District with the Government House. Afterwards, the circuit continues along the prestigious Emilio Civit street, a residential area that leads to the General San Martín Park with its 370 hectares it is the “lung” of the city. 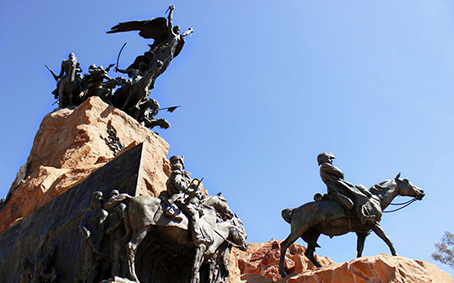 We enter through the famous Portones (gates) observing the Rosedal and the Lake until arriving at Cerro de la Gloria, where the imposing Monument to the Army of the Andes is located with its 14 tons of bronze. 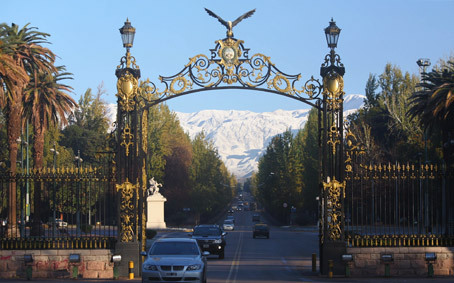 Then we will go to the Challao where is the Sanctuary that venerates the Virgin of Lourdes with spectacular view of Mendoza “pedemonte”.